Mr. Saeki has extensive knowledge and experience in preparing opinions, trials for invalidation, oppositions, suits against trial decisions, and assisting in infringement litigation. He presents lectures on patent issues in various countries. Mr. Saeki serves as a moderator at Japan AIPPI conferences, and as a lecturer of intellectual property seminars and training programs for delegates from developing countries hosted by the Japan Institute of Invention and Innovation. He specializes in air conditioning machinery, logistics, assembly systems, home electrical appliances, production machinery, automatic control systems, and motive machinery. During his tenure at the JPO, he spent some time in the United States to study at Colorado State University. 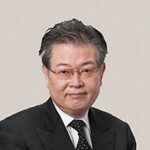 Mr. Saeki was the chairman of the APEC Intellectual Property Rights Experts Group (IPEG) from 1998 to 2000.